When levelling and aligning in and around buildings, red beams can be difficult to see. 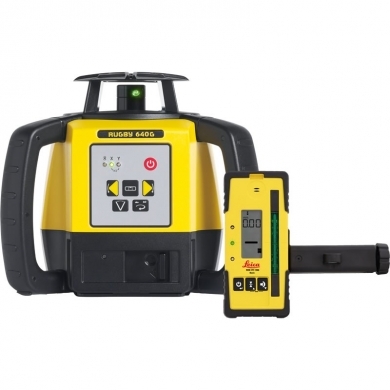 Leica Rugby 640G green beam rotating laser enables you to easily see wherever you are working. The green beam uses the latest in green diode technology, visible up to 30 metres without a receiver. An IP 67 protection and up to 60 hours operating time make these lasers the most trusted and rugged choice for any interior project. Rugby 640G is delivered with the Leica Rod Eye 120G with digital read-out ability for convenient offset readings and outstanding operating range. The universal Rugby 640G also performs reliably outdoors, even in freezing temperatures.